There was nothing but snow as I travelled to Newark Airport on February 22nd. Susannah and I chatted with the shuttle driver, but our thoughts could have been summed up in a few words: ‘It’s finally here. Panama. 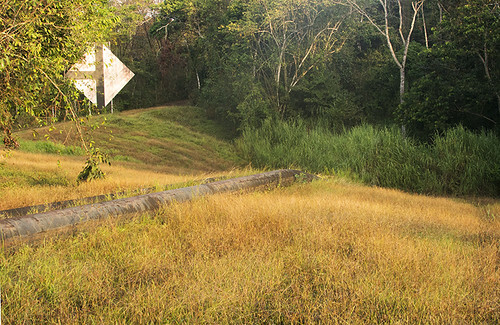 A place with No Snow!’ (See example above, the mountains of western Panama. That white stuff is fog, NOT snow.) Our New Jersey Audubon group gathered at the gate, 6 men and 6 women, including tour leader Scott Barnes. Most had already birded Panama with Scott and our Panama leader, Guido Berguido of Advantage Tours. I had never been to Panama, but I had a little neotropical birding experience, and had packed the birding essentials: bins, cameras, power cords, Tilly hat, granola bars, deet. I was looking forward to to getting to know my birding companions, and to seeing Panama, land of the canal. I was not disappointed. Here are some highlights, presented in two blog posts. And, I have to note that there were many other highlights I couldn’t photograph for one reason or another. 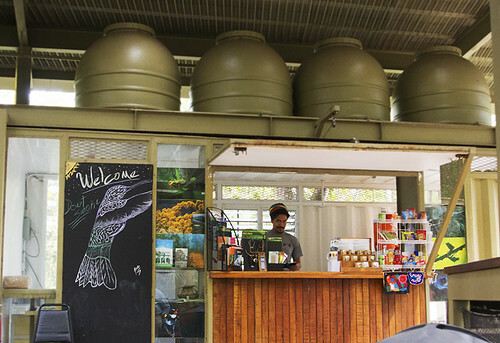 We birded from dawn to dusk, literally, on the road and in the van and during meals. The ideal birding trip. We spent our first few days at Soberania Lodge, otherwise known as Guido’s Place, in Gamboa. 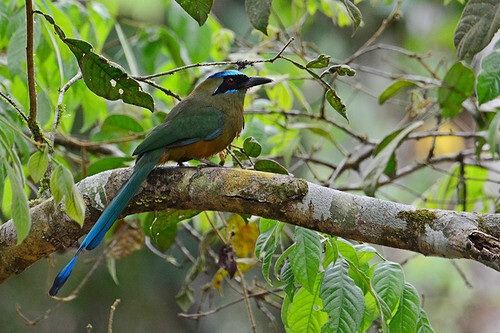 About 40 minutes from Panama City, Gamboa was once a town for Panama Canal workers, and is now the entry point for Soberania National Park, where birders bird and researchers from the Smithsonian Tropical Research Institute study neotropical plants, bats, insects, and, I hope, birds. We occasionally ran into a researcher in the park and at the lodge, which houses Smithsonian students as well as birders. 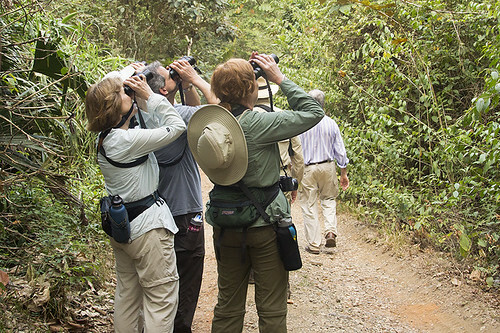 “Down time” was spent in that time honored neotropical birding pastime, watching the feeders. 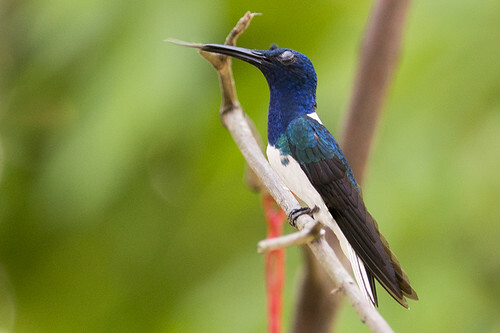 White-necked Jacobins, Florisuga mellivora, had the monopoly here. 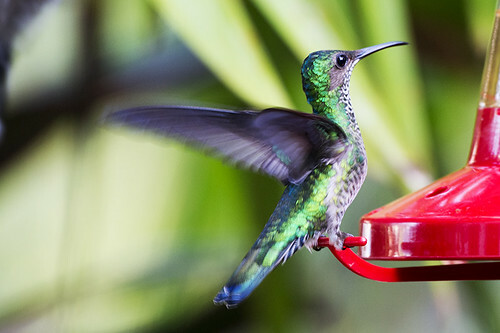 The Neotropical Birds website calls them medium-sized hummers, but I think they are huge. White-necked Jacobins inhabit a broad range in the Neotropics (I’ve seen them in Ecuador, Costa Rica and Trinidad), and can be pretty aggressive. That’s the male and the female above. The male has the distinctive white neck and is sticking out his tongue. Nectar, yummm. The female is more difficult to identify, as female hummers tend to be. 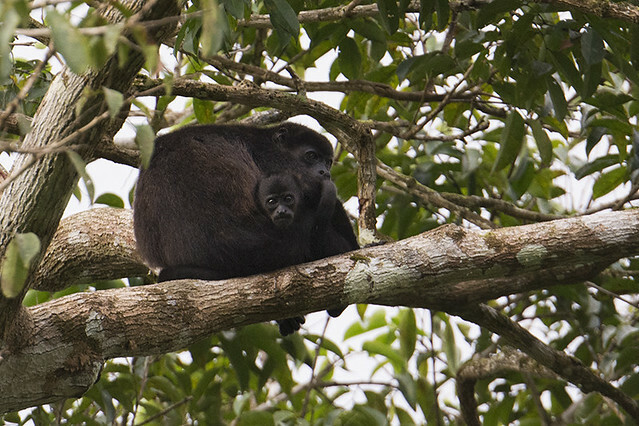 Gray-headed Chacalacas, Ortalis cinereiceps, were noisy, regular visitors, often eating every banana in sight. 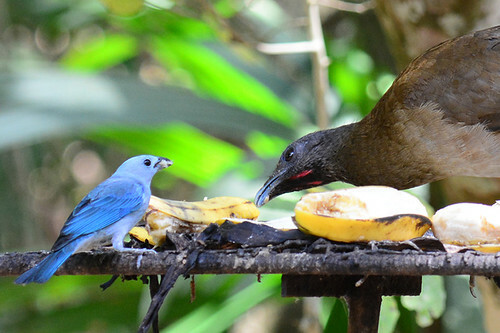 But, there were times when the other birds, like this Blue-Gray Tanager, Thraupis episcopus, just put their claws down and refused to move. 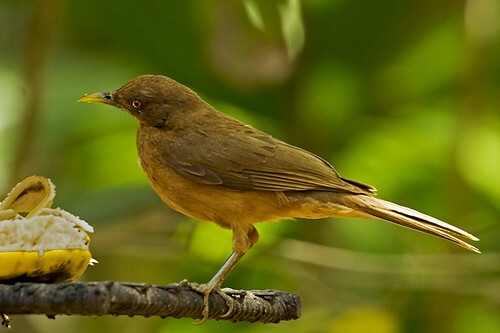 Clay-colored Thrushes, Turdus grayi, were ubiquitous, seen pretty much everywhere we went in addition to the feeders. We called them CCT’s or, for old timers, CCR’s (Clay-colored Robin, the old name). 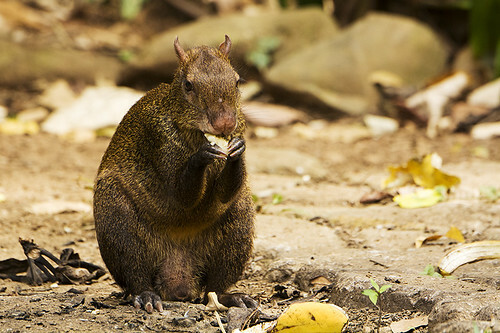 The agoutis, a rodent species, were also common to the point of being tame. It was a big difference from the agoutis in Trinidad, which also helped themselves to fallouts from the feeders but then scampered away before I could get a decent photo. 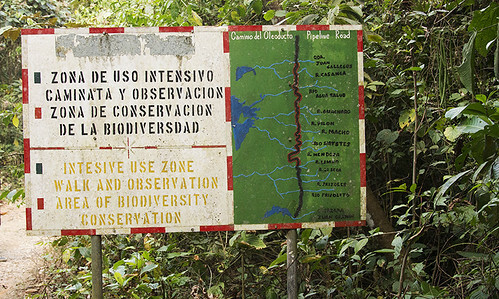 Our birding for the first few days was in the vicinity of Gamboa, with many hours spent on the fabled Pipeline Road, which is really Soberania National Park. Yeah, there really is a pipe that runs along the trail and at odd places in the forest. 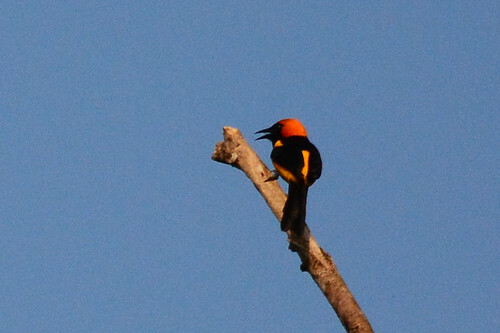 A highlight of the first morning, at the tram parking lot, was this Orange-crowned Oriole, Icterus auricapillus, below. It was the third oriole species we saw there, and apparently a very unusual one for the area. Guido and Luis, our birding guides, were very excited about it, especially Luis. Of course, we didn’t always look at birds, though there were fewer dragonflies and butterflies than I expected. Morphos flew along the path, uncatchable by hand or camera, and once in a while I spied a fantastically beautiful creature. 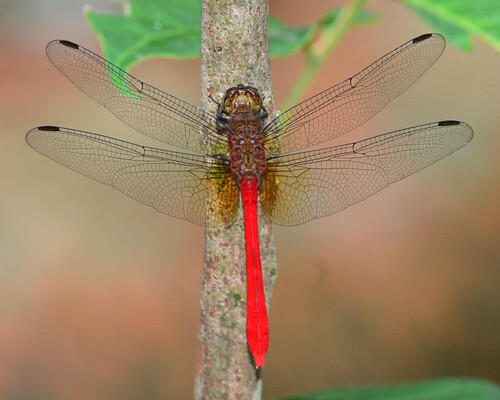 This dragonfly has no common name, it is simply known as Rhodopygia hinei. I would have like to have gotten images from the front too, but my access was blocked by the tree below, which I call simply Spiny Tree. 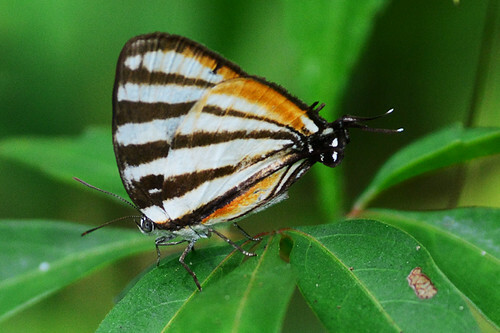 This small butterfly is known as Togarna Hairstreak, Arawacus togarna. It has a false head, intended to fool predators. Frankly, I’m not sure exactly how that works. If you’re eaten, you’re eaten, right? Does it matter from which end? 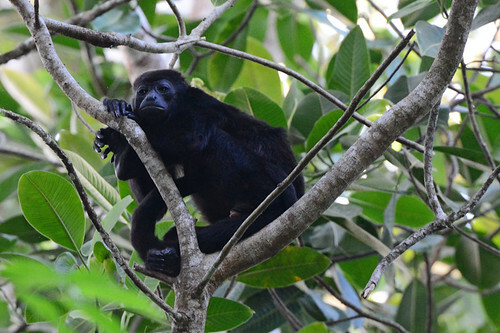 Another Howler Monkey, pondering the silly birders and life in general. One of the highlights of the trip was seeing this Rufous=vented Ground-Cuckoo, Neomorphus geoffroyi, along Pipeline Road. This juvenile bird had been seen on occasion by birders, including Luis, for the past week. Luis knew just where to go. We walked into the forest a few feet and waited. For once, our group was quiet. Soon, we could see the RVGC walking along the forest floor. Of course, a rainforest floor is not clean, it’s full of leaves and ground cover and vines and just a lot of stuff, so many of us were wiggling our heads and cameras, trying for a good full-body look and image. The RVGV didn’t seem bothered by our presence at all, he just kept on walking and poking amongst the ground cover, probably looking for nice sized bugs. It didn’t even seem bothered when I used a flash on it–thus the purple eye in these photos. 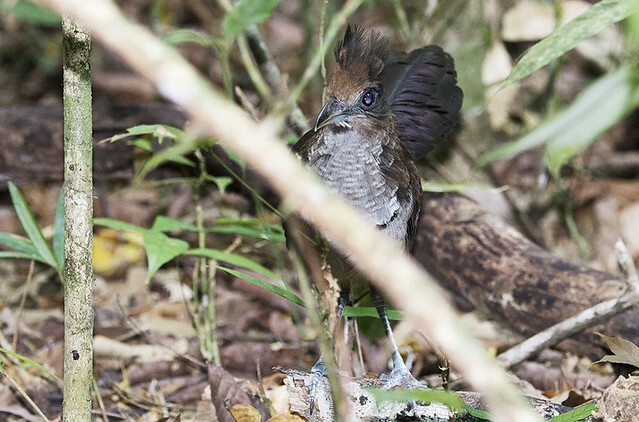 Rufous-vented Ground-Cuckoos are usually seen following large ant swarms. 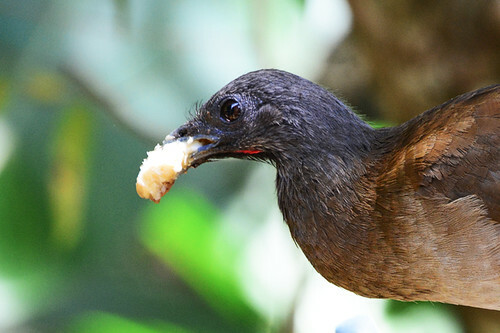 This was one of several birds we saw that week that usually follow ant swarms, so we figured we just missed one. (Darn! 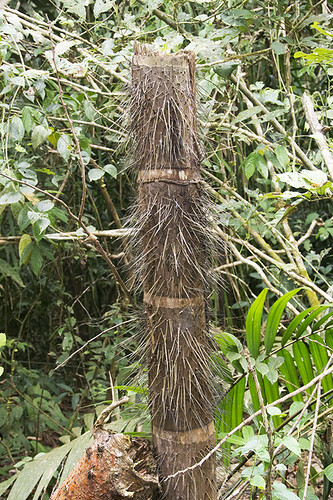 Seriously, if you are birding the rainforest, you want an ant swarm.) 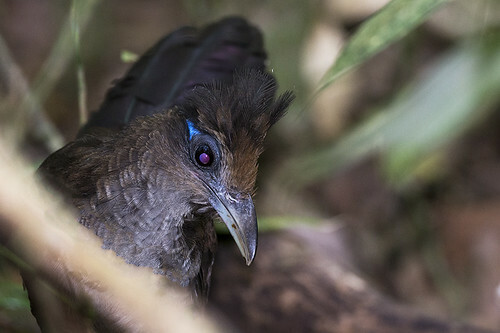 Rufous-vented Ground-Cuckoos also have a reputation as wary, skulkish birds (unless they are following an ant swarm). We were very fortunate to encounter this juvenile bird, which seemed too young to know that it should have hightailed it back into the forest as soon as one of use wiggled a finger. More in the next posting, Birding Panama, Part Two. This entry was posted in Birding, Travel and tagged "NJ Audubon", birding, birds, Panama. Bookmark the permalink. Wow you got some incredible photos of the wildlife! Birding the Rio Grande Valley–Finally!